The Betsey, surrounded by seven French corsairs. Anonymous, 1797. Courtesy of The Mariners’ Museum, Newport News, VA. The European powers were at war in the 1790’s and first years of the 19th century, and their war at sea posed obstacles to the United States’ young merchant fleet. 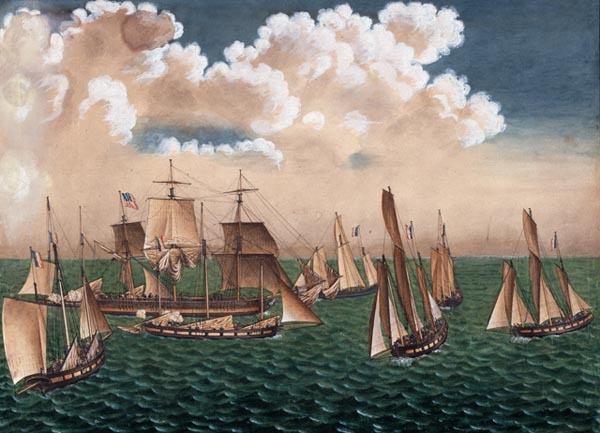 British seizure of American merchant ships and their cargoes and impressment of U.S. sailors into naval service was famously one cause of the War of 1812. 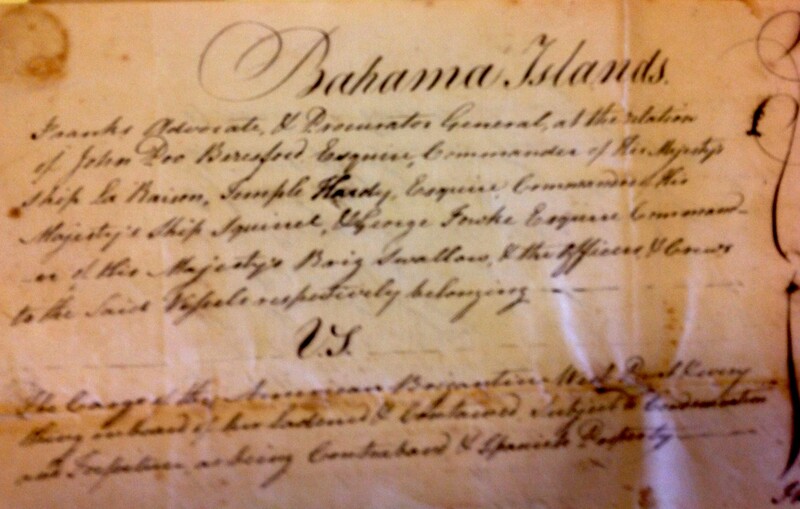 The Admiralty Court examined evidence including markings on the goods, invoices, bills of lading, and statements from the crew and, on May 3, 1797, issued its decision, preserved in our archives. Some but not all of the cargo was awarded to the British officers as their “prize.” The Court held the libel supported (i.e., it decided that the Americans had not been able to prove that the seizure was unlawful) as to three categories of property. First, the British were awarded a portion of the ship’s cargo, including 110 pieces of “osnaburg,” a coarse linen cloth manufactured in Britain; 45 iron pots, a barrel of earthenware, and a crate of cheese. These goods had no customs mark and the ship’s captain could not produce any invoices or bills of lading for them. Second, they were awarded a “large trunk of sundry articles” belonging to the unfortunate but otherwise unidentified “Francisco Selgado,” as well as other items owned by West Point crew members who presumably were Spanish subjects. Third, and probably most valuable, they were awarded 19 coils of rigging cordage, 153 barrels of tar, 17 barrels of pitch, 1 bundle of steel, and 9 casks of lead which, the Court found, were being shipped by the American crew “contrary to their neutrality as subjects of the United States.” These items presumably fell into the category of “contraband,” or items of material assistance to Spain’s war efforts. From the naval officers who populate Jane Austen’s novels to Horatio Hornblower to Master and Commander, the figure of the ambitious young man joining the Royal Navy to make his fortune is a familiar one. The “prize” system helped those men accomplish that end. The officers of the Swallow, Squirrel, and La Raison did gain from the seizure of the West Point, although none of them made a fortune that day. This entry was posted in Uncategorized and tagged admiralty, law, Royal Navy, shipping, War of 1812.